If you’re considering buying a hand held sewing machine, there are plenty of brands to choose from. These small but hardworking machines are a great alternative to a standard sewing machine. They are easy to pack or keep in the car, as they’re lightweight and compact. There are a few points to consider before buying a hand held machine and deciding if it’s right for you. Portability speaks for itself, as that’s the biggest selling point of a hand held sewing machine. 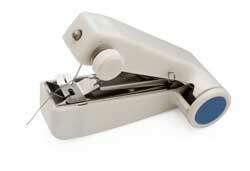 Most hand held machines weigh between 1 and 2 pounds and look much like a large stapler. They come in various sizes, but a good range is around 4 inches by 7 inches. Their lightweight and easy to manage size makes them easy to take along just about anywhere. It’s a great idea to keep one at the office for unexpected repairs. There are a few hand held models, ranging from $10.00 to $20.00. This makes it affordable to buy more than one machine. Many models come with multiple prewound bobbins, as well as replacement needles and threader. Most use batteries and come with a return guarantee in case you find you don’t like the model you’ve chosen. There are models advertising themselves as “hand held” that cost between $50.00 and $100.00. These are larger machines and need a desktop or similar surface to work on. The hand held models are a perfect fit for a child or someone who hasn’t mastered the skills needed for using a standard machine. They serve as a great introduction to sewing for kids. They also make a good gift for the college-bound student for hemming or repairing their wardrobe. Keep in mind that a hand held sewing machine is not intended for use on thick fabrics or quilting. Fabrics such as leather or heavy denim may present some challenges, forcing the needle and causing it to break. These machines can handle medium to lightweight materials and are good for fixing, sewing hems or repairing small rips. It’s easy to sew a basting line for a hem on a pair of pants or dress while it’s worn and for sewing items difficult to handle such as drapes. These machines aren’t intended to replace a regular sewing machine. is affordable and easy to use. The machine comes with three color bobbins, replacement needles, a needle threader and a thread spindle. Instructions are included. 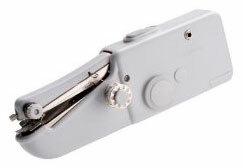 The Singer Stitch Sew Quick runs on four AA batteries or an AC/DC adaptor. Neither the batteries nor adapter is included with the purchase. This small Singer is lightweight, weighing 10 ounces and measuring 8 inches by 2 ½ inches. It is possible to buy a Singer Stitch Sew Quick machine for between $12.00 and $15.00.
. This machine is lightweight, coming in at less than a pound and costs between $10.00 and $20.00. It measures 5.39 inches by 8.94 inches and runs on battery power or DC 6-volt. A thumb-switch conveniently activates the on/off switch. 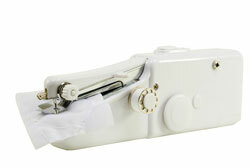 A hand held sewing machine can be a real convenience and time-saver for those quick sewing needs that come up often. Read the reviews by those people who have purchased a particular model you are interested in – often there you can find tips on using these machines to their full potential.